I got back home last night from my vacation in Switzerland. The trip was awesome and DH and I had a great time. I took lots of pictures and I hope to have time to share them with you soon! The sock you see in the picture is my Noro Kureyon Sock sock in progress. 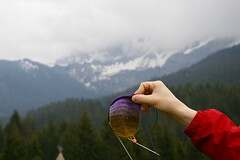 Although I didn’t get to knit much while on vacation it is now at the heel. I have the chance to share today’s birthday with two wonderful ladies which I have had the chance to meet and spend some time with. 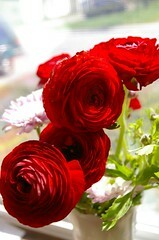 Go and wish Alyson and Tina “Happy Birthday!” Here are some flowers for you! Here’s a cute picture to cheer me and you up! Baah! Sorry about your computer sometimes they can be a real pain. This is my first time leaving a comment. I found your blog because I buy from Y4S. 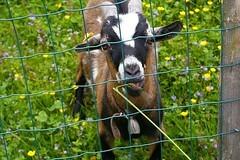 Your trip sounds like it was fun I love Switzerland and goats!!! Happy Birthday to you as well! Alas, I am spending my birthday home sick, but I hope to be recovered in time for the big party on Saturday. It helped that one of the presents from my husband was “More Big Girl Knits”! Happy birthday from your DH! Crossing my fingers that your new power source does the trick. Happy birthday too! I’m so sorry to hear about your computer! At least your new vacation photos weren’t fried along with the rest. Hope everything else is OK now that you’re home. Oh no! I hope there’s an easy fix for your computer. If not, you should still be able to retrieve your files somehow. Tag, you’re it! I was memed so I’m returning the favor. 🙂 Check out my blog for the details. I hope you’re able to recover your stuff. That would really make me sad. Oops – forgot to say Happy Birthday and that I’m glad you had a nice vacation!